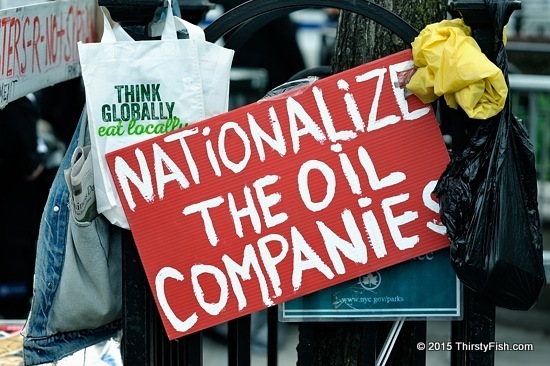 "Nationalize the oil companies" and then what? First, watch this excellent news piece titled "The Real House of Saud". And then tell me how things would be different if the oil companies were nationalized? When exploitation and injustice are driven by a handful of elite who stand to profit from the extraction of natural resources at any expense, it doesn't matter whether they are organized as corporations or governments or both. Exploitation is exploitation and theft is theft. It's not this or that political system that is the solution to our problems, it's the adherence to the most basic principles of a healthy society: Justice, fairness, equal opportunity, cooperation, trade, education, sustainability, tolerance, etc. If these do not exist, it doesn't matter how institutions are formed and organized. People don't get this.